Sally and I have been on a rare shopping spree. Neither of our mobile phones were very well. My phone, Sally’s cast off iPhone which I’ve been using for the last year, refused to have anything to do with WiFi after an operating system update six months ago, and Sally’s much loved Galaxy S4 didn’t fare too well after an unscheduled swim when it launched itself from toilet cistern to bowl last week. Apparently, says Sally, the cistern was to blame for not restraining the phone. I don’t think that excuse holds water Sally. Nor did the phone, although it tried very hard. We tried the usual fix of burying the damaged phone deep in a sack of rice for a few days but the solution didn’t work nor were Samsung or our local EE shop interested in attempting a repair. So now both of us have shiny new phones. Sally was able to instantly transfer her old number to the new phone as both phones were on the same network. Given that I haven’t once managed to obtain a signal inside the boat over the last two years I’ve been on Three’s network (brilliant on narrowboats for mobile broadband but hopeless for phones), I’ve switched to EE. Now I can sit at my desk inside the boat and use my phone for voice calls to my heart’s content, especially now that I’ve enabled WiFi calling which allows me to make and receive calls via my Three broadband dongle if I can’t get a signal on my phone. Because I’ve switched from Three to EE I haven’t taken my number with me. I know it’s possible but, to be honest, there are so few people who call me that I just can’t be bothered. I’m sure you’re not in the slightest bit interested in phoning me, but just in case you are, the number in my email signature up to and including 17th June 2015 is no longer valid. The new number is 07496 886639. Our duel phone upgrade has pretty much been the highlight of the week, apart from Thursday afternoon when we really pushed the boat out and teased the dogs. We sat on the canal-side picnic bench next to our mooring for a couple of hours after lunch watching a steady procession of boats negotiating Calcutt Bottom Lock. Much as we enjoyed the entertainment offered by fellow boaters, and the pleasure we derived from flicking grapes from the bench into the mouths of two happy spaniels, we only stayed in the marina for a single night before ascending the Calcutt flight to enjoy a few days of relative tranquillity before Sally’s reluctant return to work on Monday night. I say “relative” tranquillity because at this time of the year, especially at the weekend, the stretch of canal between Braunston and Napton junctions is a watery motorway. A steady procession of boats roar past us from dawn until dusk. Fortunately the secure moorings offered by miles of Armco barrier along this section mean that we can resist the pin pulling surges created by dozens of fast moving boats through the course of the day. What we can’t avoid are frequent unwanted and sometimes far too close neighbours. We actually had one hire boat crew moor so closely to us yesterday on an otherwise boat free stretch that they used the ring on our piling chain to thread their bow rope through. When we set off we had to untie their bow so we could free our chain then secure their rope directly to the Armco. Of course, we can’t reasonably expect to find a peaceful mooring at this time of the year on a stretch of canal within a few hours’ cruising of more than two thousand marina moorings and hundreds of hire boats. If we want quiet summertime moorings we’ll need to head a little further afield. The manmade drainage ditches of eastern England have created over two hundred miles of peaceful cruising for solitude loving boat owners. It’s England’s Big Sky country with wide views and stunning sunsets, no noise from busy roads, railways and aircraft flight paths or even other boats. It’s the perfect place to get away from the hectic pace of modern life. A great place to start if you want to get a feel for the Fens is Fox Narrowboats’ web site. There’s a wealth of information about the area including lists of places to visit, routes and navigational data. The more I drill down into the information they’ve compiled the more impatient I am to visit the area. I know that Peter Earley, top forum poster and creator of most of the forum’s cruising guides, is exploring the area this year. If I speak to him nicely, I hope he’ll write another painstakingly researched guide ready for our cruise. The Fens is one of the planned routes for next year, but for the next week we’ll have to endure one or two more boats on the water than we’d like at an otherwise wonderful location for a week before we set off on our next cruise this year. We’re be heading south this time, along the south Oxford canal on to the Thames and then pottering about between Oxford and Lechlade. We’ll make sure that we spend every minute of the week allocated to us by our seven day £70 EA licence. Next year we’ll upgrade to a Gold licence which includes the EA controlled waterways but we couldn’t resist a spell on the mighty Thames before then. We’ll stay close to Calcutt for the two discovery days I’m running next Saturday and Sunday before we set off on our three week cruise. I’ll make sure I avoid Brauston on those days because of the historic boat rally but I seized the opportunity yesterday to visit Braunston marina before next weekend’s mayhem to buy two eye wateringly expensive tipcat fenders for the back of the boat. I had a very smart but completely useless button fender hanging off the stern until yesterday. It was of no use at all because my large rudder extended a foot beyond it. The only way to protect the rudder from impact damage was to fit two tipcat fenders next to the stern and then fix the button fender to the outside. All three fenders are fitted now, and very smart they look too. All I need to do to test their effectiveness is reverse into a few lock gates. I’ll let you know how I get on. Talking of hitting things in locks, lock accidents is the focus of this week’s newsletter. Last week I detailed a few tips and techniques to help you cruise with confidence and avoid the waterway’s many novice boaters who are more of a risk to you and your boat than your own helmsmanship. In this article, I’ll focus on locks but, rather than repeat the information on lock techniques I included in this newsletter last May with a little help from Peter Earley, I’m going tell you about a few lock accidents caused by carelessness or lack of knowledge. I don’t want to frighten you but I think a healthy respect for locks is very important. A large volume of water, roughly 40,000 gallons in each of the Grand Union’s double locks, rushing in and out with great force, moss and lichen covered lock walls and sides, steel boats weighing between fifteen and twenty tonnes and inexperienced narrowboat crews, many of whom have had a drink or two, are a potentially lethal combination. The first accident, on the south Oxford canal a day and a half’s cruising from my base at Calcutt lead to the tragic and brutal death of an inexperienced holiday boater. Here’s the newspaper report. The novice crew made a few fundamental mistakes in the lock. The first, although not life threatening, possibly caused an additional problem which distracted the lady at the helm. She left the rear deck to pull in a hanging fender. The 6’10” wide boat was in a lock only two or three inches wider than the boat. 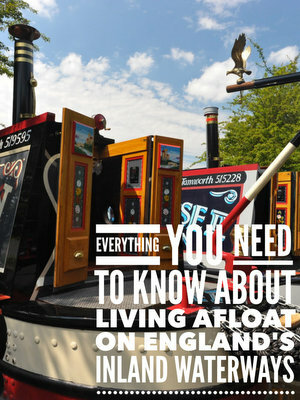 Fenders should only be left in position on a narrowboat when it’s moored. 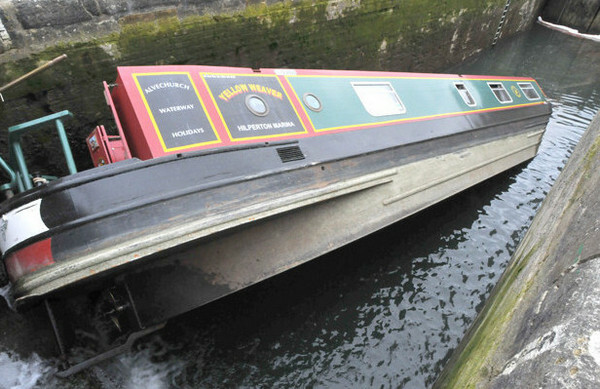 If they’re left down, especially when entering a narrow lock, there’s a good chance they will either be ripped off the boat or will jam the boat in the lock. While the lady was away from the stern, the fast flowing water coming into the lock had first flowed to the lock’s rear gates then quickly pushed the boat towards the upstream gates. The boat had been put hard into reverse to counteract the sudden flow. As the lock filled, the water’s forward force would have decreased allowing the out of control boat to rapidly move backwards. The lady appears to have reached the stern just as the boat hit the back gates, catapulting her into the water as the stern bounced away from the gate, allowing her to fall into the water beneath the boat before the craft with its rapidly spinning propeller, still in reverse, moved back towards her and the gate. The accident could have been avoided very simply. All she had to do was to move the boat close to the front gate when she entered the lock then instruct her crew to gently raise a single paddle for long enough for the water coming in to the lock to first flow to the back of the chamber then push the boat slowly forward until it was held against the front gate. Once the boat was secured, her crew could raise both paddles fully without fear. Using this technique, she wouldn’t have needed to reverse the boat at all. I wrote about this accident a couple of years ago. I can’t remember everything about the boaters concerned but what little I can recall is enough. Two experienced boaters were on the maiden voyage aboard their new boat. They had both recently retired and were looking forward to spending the rest of their time afloat gently exploring the inland waterways. Both had cruised thousands of miles and negotiated hundreds of locks during decades of recreational boating. Calcutt Top Lock was familiar to them, as were the fifty similar locks on the Grand Union canal between Napton Junction and Birmingham. The lady, who retired from full time employment at the end of the week before the accident. Without a care in the world, she nimbly stepped from her slow moving boat as it bumped gently against the concrete sided lock landing. With her focus on the lock as her foot landed on the towpath, she failed to see the small metal bollard which tripped her. She landed awkwardly on the towpath catching both her head and shoulder. The impact knocked her out, fractured her cheek and broke her collar bone. When the emergency services arrived she was conscious but in a great deal of pain. The paramedics wanted to carry her to the ambulance on the opposite side of the canal on a stretcher but they couldn’t do so safely over the lock gate. We had to carefully strap the stretcher across her own boat’s bow then float her and her boat over the water. I understand she made a full recovery but raising heavy lock paddles was out of the question for a number of months. A middle aged man walking his German shepherd used the upstream gate of Calcutt Top Lock to cross the canal from Calcutt Boat’s grounds over to the towpath. His dog was on a lead and preceded him over the gate. The sure footed dog raced ahead so his owner checked him with the lead a little too enthusiastically. He pulled the big dog off the gate into the empty lock. The 100lb plus dog hung by its neck as his owner tried to hold on to the lead which scorched the skin on the inside of his arm before slipping through his fingers. His beloved pet dropped eighteen inches to the exposed concrete cill where it stood shivering in fear. A novice helmsman on a hire boat entering the lock saw the dog fall and, in a well-meaning but ill though out attempt to go to the dog’s aid, surged towards the front gate and the stranded animal. The hire boat hit the concrete cill with enough force to lift its stern and almost catapult from the front deck onto the concrete ledge beside the dog. One of Calcutt Boats’ wharf staff and I managed to stop the panicking boaters by shouting at them loudly. We then closed the bottom gates, shutting both boat and dog into the lock together. Then we slowly let water into the lock to float the hire boat above the cill so that it could move closer to the stranded shepherd. With the placid animal lifted safely on to the boat’s front deck, we were then able to float the boat up and reunite tearful owner and shivering dog. I know that an accident caused when reversing a boat shouldn’t be in this week’s lock section, but I forgot to include reversing last week. Anyway, our wharf is in the middle of a lock flight, so there’s the connection if I need one. As you will see, a heavy bronze propeller spinning more than 1,000 times a minute while you stand on an unprotected and often slippery deck less than two feet above it is a potentially dangerous and sometimes lethal combination. The owner of a recently purchased private boat pulled in to Calcutt Boats for fuel. Mooring against the wharf is often a challenge for inexperienced boaters, especially if they want fuel. In the rather congested pound between Calcutt Middle and Top locks they have to turn their boats away from the wharf then reverse onto it. It’s not a manoeuvre many narrowboat owners have to attempt very often. This particular guy made two very silly mistakes. One of them nearly cost him his life. He managed to turn away from the wharf and then reverse towards it without too much fuss but then, when he was within twenty feet of one of the wharf staff, threw his stern rope away from the boat towards him. That was mistake number one. The trailing rope fell into the water in front of the advancing boat with its thrashing propeller. A bystander warned him that the propeller was likely to catch the rapidly sinking rope so the boater, panicking slightly at the thought of fouling his propeller, quickly stepped on to the back edge of his deck to reach the training rope… and slipped from his boat in front of the now out of control boat moving towards him. The propeller caught his leg, slashed through clothing and flesh and severed his femoral artery. Quick thinking by Calcutt staff saved his life. He was quickly hauled from the water where one of the wharf staff stemmed the gushing blood flow by pinching the wound together until the air ambulance arrived. The boater made a full recovery after months of conversance, unlike the unfortunate boater who died in this tragic accident. Many boating accidents are caused by carelessness, sometimes enhanced as a result of enjoying a relaxing waterways break slightly too much. I’ve lost count of the number of, usually male, boaters jumping on and off their boat roof while it’s in a lock, often trying to steady a hand held can of beer as they lead gazelle like from steel to stone. This particular boater’s relaxant was inhaled rather than imbibed. The scruffy boater’s suspiciously long hand rolled cigarette gave the game away as he more floated than walked along the side of the lock next to his dilapidated GRP cruiser. He emptied the first of the three locks in the Calcutt flight as he enjoyed a very mellow cruise towards Stockton. With the lock empty he walked to the lock side to climb down to his boat, misjudged the edge, slipped in to the lock and fell heavily on his boat roof. Fellow boaters rushed to his aid but he climbed unsteadily to his feet before declaring that he was uninjured and continuing through the flight. By the time he pulled his cruiser out of the bottom lock he was complaining of severe chest pains. Our office called emergency services and within minutes the first response paramedic arrived shortly followed by an ambulance and a helicopter. Once more, the ambulance crews struggled because the boat owners was on the towpath on the opposite side of the canal to the paramedics and their fleet of vehicles. The “injured” boater was asked to walk a hundred metres back along the towpath to the top lock and cross the top lock to the waiting vehicles. This boater escaped with bruised ribs and, possibly, an aversion to smoking while he cruised. It’s the Calcutt flight again. This time a very experienced solo make boater in his sixties taking his boat from one of Calcutt Boats two marinas up through the flight. He employed one of two techniques used by solo boaters to take their boat up through a lock. He pulled on to the lock landing, secured his boat using his centre line, set the lock then returned to his boat take his boat in. As long as the lock entrance isn’t obstructed by a bridge, it’s usually possible to steer your boat slowly into a lock then step off holding the centre line, walk swiftly up the lock steps flicking the centre line over the gate then, with a quick turn around the bollard closest to the downstream gate, bring your boat gently to a halt. On this occasion used the alternative method. He brought his boat into the lock then, as he was about to climb onto his roof and then out of the lock, slipped into the icy lock water. He clung to his gunnel but, weighed down by clothes and advancing years, he was unable to climb back on to his boat. Nor was he able to move around his boat and into the gap between his boat and the lock wall to reach the slippery rungs of the escape ladder fifty feet away. He shouted for help for fifteen minutes before another boat owner in the marina heard his cries and managed to drag him out of the lock on to the towpath. Calcutt Boats’ first aiders arrived quickly but couldn’t warm him up. An ambulance arrived. They failed too, so he was whisked off to hospital. I can’t remember what time of year the accident occurred but I don’t think it was during the winter. Longer immersion at a different time of the year could have been fatal. Fortunately the boater suffered no ill effects. Unfortunately, the experience put him off boating so much that he sold his boat soon after the accident. The most often talked about lock danger is getting your boat caught on the cill. For the uninitiated, the dreaded cill is a concrete ledge inside a lock close to the upstream gates. You must, at all times, keep your boat in front of the cill marker which will always be behind your boat when you’re going down in a lock. If your boat is behind the cill marker as the water empties from the lock, your rudder may catch on the cill, holding the back of your boat at a higher level while the front continues to drop with the water level. If the lock is deep enough, the bow will continue to drop until it pierces the surface and the bow floods, shortly followed by the cabin. Narrowboats, usually but not always hire boats, sink or are damaged in cill related accidents every year. You need to be constantly aware of lock cills and their danger, but you don’t need to worry about them. Cills are easily avoided. The trick is to leave your throttle alone once you’ve brought your boat to rest in a lock. That’s all there is to it. Move your boat forward until the bow is close to the downstream gates. As you raise the downstream paddles to empty the lock, water leaving the chamber will pull your boat forward away from the cill. The mistake made by many novice boaters is to reverse the boat away from the downstream gates and towards the dangers of the cill behind. Do not reverse your boat. Once the lock is empty you need to be aware that your boat may drift backwards towards the exposed cill but the only risk you now face is banging your rudder against the exposed concrete if your rear fender isn’t long enough to protect it. If the lock is empty you won’t snag your boat on the cill and sink it. Even if your boat drifts behind the cill marker and catches the cill, all is not lost. Immediately drop the downstream paddles to prevent any more water leaving the lock, then open the upstream paddles to allow more water to flow into the lock and raise your boat away from the cill. Work quickly but don’t panic and always make sure that the downstream paddles are closed before you open the upstream paddles. Here’s the Daily Mail’s account of the stag part accident. Cill accident aren’t just the domain of drunken revellers. Here’s another account of a cill sinking. This time the hirers are a middle aged couple. I hope the above examples have made you realise that although boating on the inland waterways is one of the most relaxing methods of travel imaginable, you need to have a healthy respect for the potential problems you face if you aren’t careful, especially in locks. “The main reason for booking a discovery day, was to pick up some tips on solo boat handling and to see if it would be something I would be confidently able to do, and also to get a better insight in to the layout of a narrowboat that was geared towards full time live aboard. My plans for the future in the short term include hiring, shared ownership, and then ultimately narrowboat ownership. The pre-event information was clear and concise and very well written with clear directions to the boat. Of the emails I did send with questions, they were always answered in a friendly and timely manner. I had a great day Paul, and you were so easy to get along with and take instruction from. It was just like spending time with a friend. It was a very well thought out day to cover the things I requested when you gave me the chance to tell you what I wanted from my day on board the boat. I had all my questions answered with patience and understanding.